The controversial 1967 cult spaghetti western from director Giulio Questi will gun down Blu-ray at high noon in June. In an early announcement to retailers, Blue Underground is preparing 'Django Kill...If You Live, Shoot!' for Blu-ray on June 19. 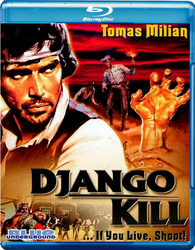 You can find the latest specs for 'Django Kill...If You Live, Shoot!' linked from our Blu-ray Release Schedule, where it's indexed under June 19.